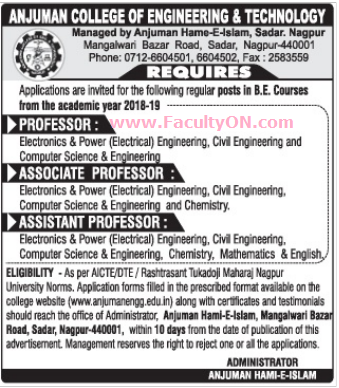 Anjuman College of Engineering and Technology, Nagpur has advertised in THE HITAVADA newspaper for recruitment of Teaching Faculty- Professor / Associate Professor / Assistant Professor jobs vacancies. Interested and eligible job aspirants are requested to apply within 10 days from 07th June 2018. Check out further more details below. About College: The Anjuman College of Engineering and Technology [ A.C.E.T.] is managed by Anjuman Hami-E-Islam, Nagpur. It is a pioneer Educational Trust, serving the cause of education in the region. For well over 128 years. Irrespective of the considerations of the various caste and creed It has wide spread reputation in the field of education in Vidharbha and is currently running 20 educational Institutions. Anjuman Hami-E-Islam started an Engineering College from academic year 1999-2000 with three branches Mechanical , Electrical , Electronics and Telecommunication, two more branches viz. Computer Science & Engineering and Civil Engineering has been added. Slowly and steadily the College has carved a niche for itself and has established itself as a name to be reckoned with providing quality Technical Education at a very affordable cost.